Have you tasted a tomato from the supermarket lately? I would describe the experience as a serious anti-climax, compared to the tomatoes I’ve tasted from my Mother’s veggie garden, reminding me of a trip I took to Italy – in their richness and flavour. But the difference between these two tomatoes isn’t simply that one has been genetically modified, and the other grown on the back of nature, free of pesticides or chemicals. The benefit of the tomato my mother let me pick straight off her vine that day has come from soil that has a medicinal quality to it, in it’s biodiversity to the human microbiome. When you eat, you’re not only feeding yourself but also your gut bacteria, which influence your gut microbiome and in turn, your behaviour and personality, your weight and happiness. Your mood, your energy levels, your levels of stress and anxiety and your cravings – are all signals from your gut microbiome, which we now know, is communicating with our brain. 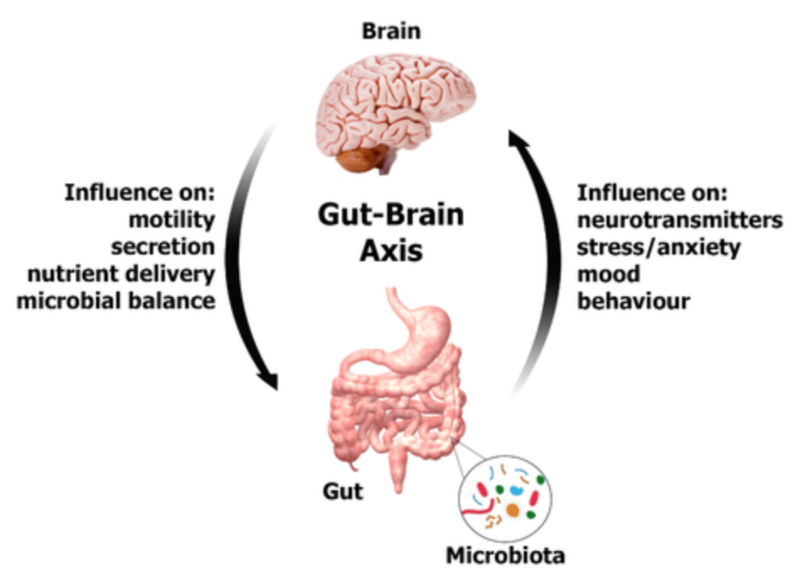 This two way communication is know as the gut-brain axis, and it’s this communication that is critical to what messages our microbiome send out to our cells to function properly, and in turn how healthy we are. When we lose that communication between the bacteria in our gut and our brain, we are not getting the critical messages we need for our cells to repair properly. This sets off a chain reaction throughout the body, such as our cells not being able to trigger apoptosis, or the death of a cell, and that’s when our gut health starts to spiral down, auto-immune conditions become more prominent and neurodegenerative disease such as Parkinson’s and Alzheimer’s become the norm. What happens in our body is over time our cells accumulate damaged proteins, oxidised particles and other parts that stop the cells functioning optimally and this gut-brain axis communication is vital in this process, and what my Metabolic Switch Gut Program dives deeper into. You just have to look at how these sorts of conditions have exploded in the last 20 years – everyone seems to have an allergy and both auto immune and neurodegenerative conditions are much more prominent. Alzheimer’s particularly in elder women has nearly quadrupled, alongside Parkinson’s in males. And scientists are now making the connection in the importance of the gut microbiome and how this aspect controls both our bodies and our brains. When we eat food from large conventional crops like our wheat, corn and vegetables that have been sprayed with glyphosate, an antibacterial weed killer, it infiltrates the soil we harvest these crops in. The effect this has is it disrupts the bacteria living in that soil, when we eat that food, which communicates with our gut microbiome and sterilises it, actively wiping out all the bacteria living there. And this alone has made massive genomic changes to our gut lining and overall gut health. So repairing your gut is not a simple solution of eating more kombucha or sauerkraut or taking some digestive supplements. It starts way more upstream that that, in eating the right foods and from the right sources. It means the food you do choose coming from soil that is biodynamic, so you get the nutrients from the plant, as well as the medicinal benefit from the soil, for your gut. It also means eating natural pre-biotics foods that feed the good bacteria in your gut to grow and avoiding foods that cause inflammation or irritate the gut and lead to leaky gut and autoimmune reactions. That’s why I find with the women I coach, when they present with symptoms of low energy, anxiety and trouble sleeping, by first focusing on adopting the nutritional approach and habits they need, it has the effect of regulating their hypothalamic pituitary adrenal (HPA) axis, part of the larger gut brain axis – and gives them instant relief from their symptoms. It’s not surprising. When you start eating the correct food that hasn’t been sprayed with weed killers, herbicides or pesticides, you’re able to give your gut microbiome what it needs to quickly correct any gut issues. The gut brain axis signalling from the central nervous system of the brain means addressing how you identify and deal with your subconscious triggers to stress will be integral to mastering your stress hormones, making your gut work for you, rather than against you. This is the second part of what we focus on, because when you know how to deal with your stressors, your brain stops dumping adrenaline and cortisol, singling to your gut that your survival is under threat every time you encounter a subconscious stressful thought, which in turn is throwing your HPA axis and central nervous system (CNS) into overdrive. These are all aspects I will cover in much more detail in my Gut Brain Axis Masterclass, which gets specific on your unique situation, because here’s the thing : everyone is different and needs a different approach, based on their hormones and where they’re at. Breathe air in nature where the soil is intact. Eat organic food – because it’s been grown in soil that’s biodiverse (no herbicides, pesticides and glyphosate). Prioritise diversity in your organic food. Avoid the foods that cause inflammation and irritable your gut and focus on Prebiotic Rich Foods. Unlock Your Hidden Mental Triggers to Stress. Knowing how to manage and lower stress can start to heal your gut. And if you’re ready to get rid of your gut symptoms and increase your energy, happiness and finally get a good night’s sleep, then my Gut Brain Axis Masterclass, running on 4 March is a no-brainer. We’ll go into the specifics of the Exact Nutritional Approach to Boost Your Energy by 200%, Get Rid of Gut Issues And Enhance The Connection In Your Gut Brain Axis. Anna’s mission is to connect, support and empower women who are stressed, overwhelmed and fatigued to start taking control of their gut health. Anna does this through her Metabolic Switch and Fatigue to Flourish Wellness Coaching program, Workshops and Masterclasses.